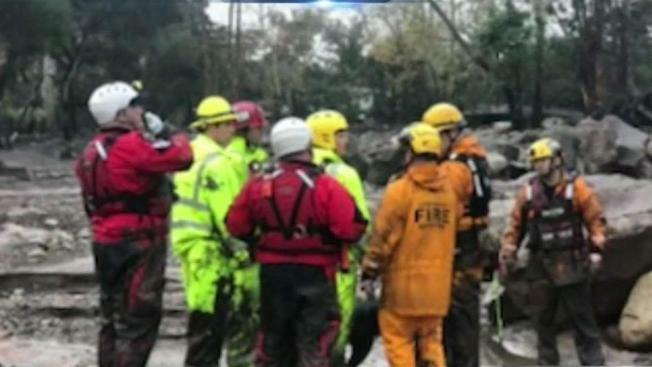 Recovery crews were slowly making progress digging away masses of mud, boulders and toppled trees in a California community that was ravaged by deadly mudslides, but officials said they've removed enough debris from creek canals to prevent another potential disaster when the next rainstorm hits. Workers were using backhoes, jackhammers and chain saws to clear the debris in Montecito, nearly a week after a powerful storm sent flash floods cascading through mountain slopes that were burned bare by a huge wildfire in December. Another body was found Sunday, bringing the number of fatalities to 20, Santa Barbara County spokesman Justin Cooper said. The coroner's office would identify the latest victim, he said. Four people still remain missing. In addition to trying to find those who are still missing after Tuesday morning's storm, crews have made it a top priority to clear out debris basins and creek canals before another rainstorm. Long-range forecasts gave the crews about a week before the next chance of rain -- and potential new mudslides -- although the precipitation was expected to be disorganized and light. Another system was possible two days later. "If we don't get those debris basins cleaned out, then we're not going to be prepared for the storm and we don't know what that storm is going to look like," said Robert Lewin, Santa Barbara County's emergency management director. The mudslides ravaged the affluent community, destroying at least 65 homes and damaging more than 460 others, officials said. Firefighters went door to door along several blocks, checking the structural integrity of the damaged homes. The rest of the community's infrastructure was also damaged. Some streets were cracked in half and authorities closed bridges and overpasses because they were unstable. "The bridges, the roads, they all need help," Lewin said. Eight large excavators were being used to clear the debris from Montecito Creek, Tom Fayram, the deputy director of the county's flood control district, said. "Two days ago I passed by an area where there was no creek and today I went by and the creek was fully restored," he said. "We are making great progress and we have several days before that next storm." A candlelight vigil for the victims and an interfaith service is planned for 5 p.m. Sunday at the Santa Barbara County Courthouse Sunken Garden. Much of the community of about 9,000 remained under mandatory evacuation orders, even unscathed areas, as crews both removed debris and worked to restore water, sanitation, power and gas. Santa Barbara County has released an interactive map of the structures that were damaged or destroyed in the Montecito mudslides. Click here to view the map.